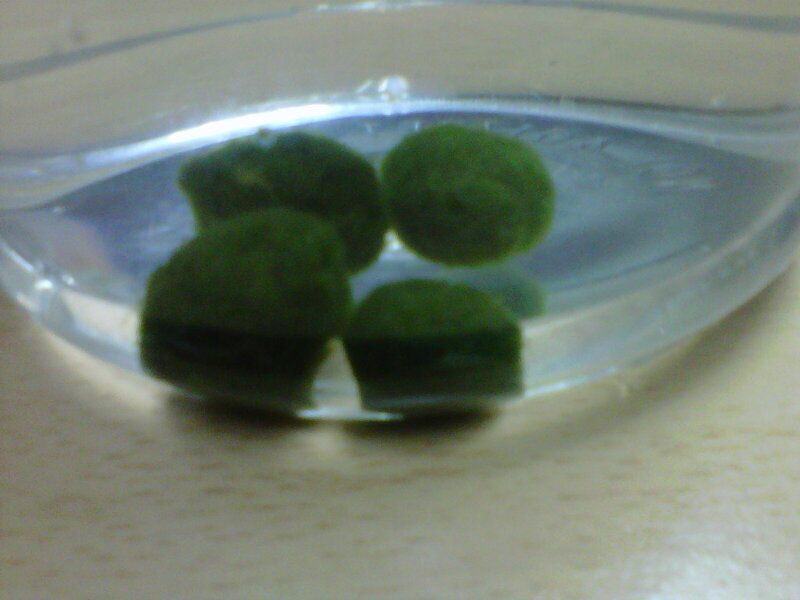 Hubby bought us some marimo babies when groupon was having an offer for them. 4 nano sized marimo. After waiting for 1 week plus, it was finally courrier to me. It was send to us without water in a little snap-lock bag. Those poor things were a little squashed. I rolled them in my palm and drop them into a bowl of water. Marimo is literally translated as seaweed ball. They are known as lake ball. A type of algae which grow about 5 mm each year into a large green balls. Found in countries like Iceland, Scotland, Estonia and Japan (according to wiki). I know it’s very popular in Hokaido, Japan. They even have a musuem for marimo ! Interesting. They are suppose to be easy to care for. No need to feed (lucky for us – or the poor thing might starve to death). Only need to change water every 1 – 2 weeks. add a little salt if they look sick.